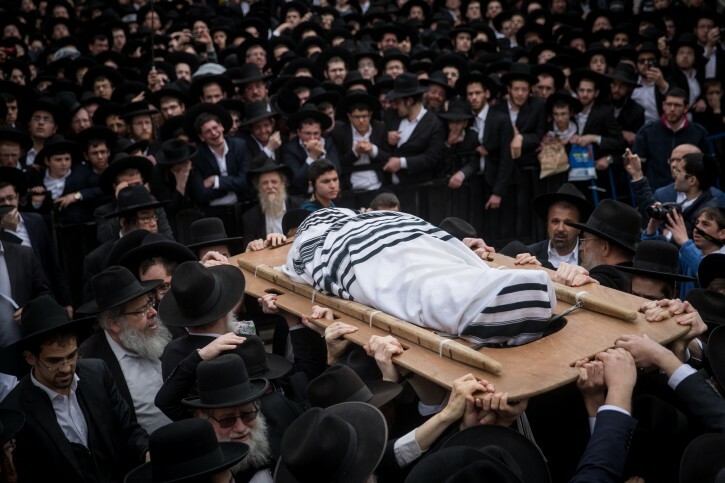 Jerusalem - Tens of thousands of people arrived in Jerusalem to attend the funeral of Rabbi Shmuel Auerbach, who was head of an extremist ultra-Orthodox community known as the Jerusalem Faction. The funeral commenced in Jerusalem at 11:00 A.M. Sunday morning. The funeral procession began in the Sha’arei Chesed neighborhood and proceeded to Har Hamenuhot, the largest cemetery in Jerusalem. A number of MKs and government ministers eulogized Rabbi Auerbach after the haredi leader passed away on Saturday. Rabbi Auerbach, 86, passed away on Shabbat (the Sabbath) due to a heart issue. He served as the dean of the “Ma’alot Hatorah” yeshiva and was an influential rabbi in the haredi community, leading the fight against haredi enlistment in the army by opposing registration of haredi young men with the IDF. “Together with all of Israel, I share in mourning the death of Rabbi Shmuel Auerbach, the Rosh Yeshiva of Ma’alot HaTorah and one of the leaders of the Torah world in our generation,” said Deputy Minister of Health MK Yaakov Litzman (UTJ). “In his death, haredi Judaism lost one of its great leaders,” added Litzman. “Under his leadership, he was a loyal shepherd for tens of thousands of students, who for many years devoted themselves to the Torah,” added Litzman. Agricultural Minister Uri Ariel said that “Rabbi Shmuel Auerbach’s legacy is a great loss to the world of Torah. His words at the Maalot Torah Yeshiva he established will remain with his legacy alongside his enormous diligence In the Torah, which he devoted with great devotion to his tens of thousands of students”. Rabbi Avraham Dov Auerbach, the deceased’s brother, delivered an eulogy too, lauding the sect’s leader’s strength. “He was a humble and quiet man, but he had the power of truth without bearing a grudge. The truth cannot be enforced. We didn’t understand how this quiet man could do such things. Some thought that he didn’t understand, but he was Mordecai the Jew, who knew everything that was done,” he said. Rabbi Auerbach is renowned for breaking off from the mainstream haredi world and forming the Jerusalem Faction. He first left the Degel Hatorah party a short time after Rabbi Yosef Shalom Elyashivpassed away and Rabbi Aharon Yehuda Leib Shteinman, who passed away in December 2017, became the leader of the Lithuanian-haredi (Litvish) public. Rabbi Auerbach then led the “Bnei Torah Movement” or the “Jerusalem Faction Group,” known for exacerbating the haredi community’s fight against drafting haredim into the IDF. Rabbi Auerbach believed that Rabbi Shteinman’s policies on the haredi draft were too compromising, and saw himself as the continuation of the more extreme Litvish leader Rabbi Elazer Menachem Man Shach. To this end, he told his followers to go into the streets and actively protest drafting haredi men into the IDF. These protests were criticized by other haredim, who consider them to be a desecration of G-d’s Name. Rabbi Auerbach was buried next to his wife. I always appreciate these photo features. Anyone not in full fledge embrace of ALL the Sedom laws of the treifeine medinah is dubbed an “extreme” person. Rabbi Auerbach, z”l was part of the government, he wasnt anywhere disassociated from it. He had party affiliations within the government which shld already give him a pass of not “extreme”. BUT?? He was dead set against ANY form of drafting to the tumene IDF. This only a zchus for him. May his memory be blessed.